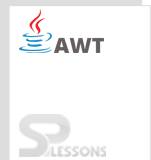 AWT DataTransfer can be done using java.awt.datatransfer package. It is the combination of classes & interfaces and helps in data transfer between the inter and intra applications. All these classes helps in transferring the data even if the copy-paste action is performed. API should support both the existing as well as the future transfer models. API allows data transfer between the both Java and non-Java applications. It creates the data types dynamically. 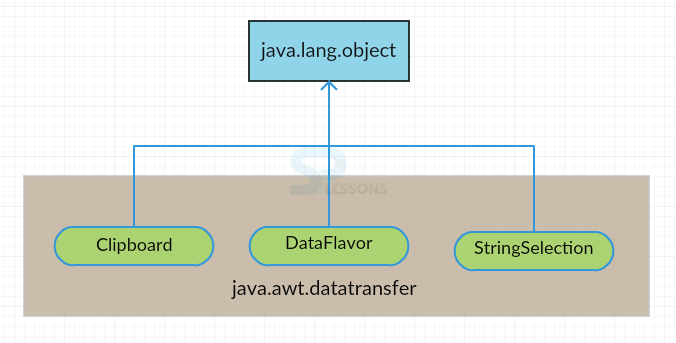 As said, java.awt.datatransfer.Transferable is the interface required to perform the data objects. When the data is moved from one application to other application, it should be compatible with the format of the new application. So, to overcome this problem, Data Flavors are used. The flavor depicts the information such that it can be used on any application. This information will be given a name and a class representing the class of object. Multiple data transfer is not possible in a single transfer operation. Clipboard operations must be enabled to implement them in the native clipboard platform. Creation of private clipboards must be enabled. The interfaces to be used are java.awt.datatransfer.Clipboard and java.awt.datatransfer.ClipboardOwner. It should not effect the performance. Drag and Drop operation should be done between the Java application and native applications. Drag and drop operation requires a source from where the data should be dragged and a target to where the data dragged should be dropped. The two interfaces required are java.awt.dnd.DragSource and java.awt.dnd.DropTarget. AWT Data Transfer requires Transferable interface. StringSelection helps in multiple data transfers. Clipboard API helps in copy/cut and paste the data onto the required application. Drag requires a source and drop requires a target.